Mahmud Nasir (Djalili) may not be the most observant Muslim, but deep down he is a true believer. His life is turned upside down when he learns not only was he adopted—but most scandalously his birth mother was Jewish! And his given name was Solly Shimshillewitz! As Mahmud tumbles into a full-scale identity crisis, a true comedy of religious errors unfolds. 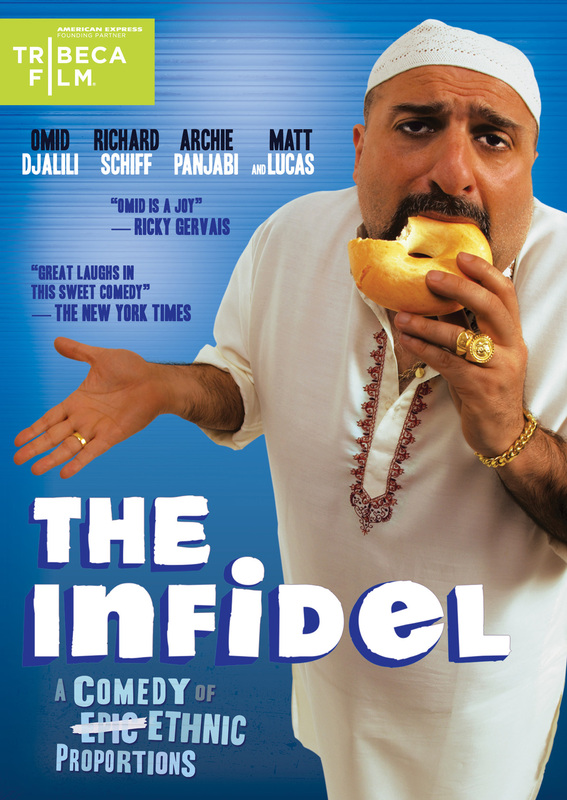 “With Muslim jokes, Jewish jokes, liberal gay- friendly Imams, and fundamentalist Muslim characters with sunglasses and hooks, it’s hardly surprising that The Infidel, directed by Josh Appignanesi, has caused a sensation…,” the Daily Beast declares. The single disc comes stuffed with irreverent bonus features, including a commentary with the director and cast, making-ofs, interviews and behind-the-scenes featurettes. The release of The Infidel is among the first of 10 Tribeca Film titles scheduled to be distributed by New Video in 2010 and 2011. Tribeca Film is a distribution platform acquiring and releasing films year-round and is supported by Founding Partner American Express. The films range from award-winning dramas and revealing documentaries to uproarious comedies and stunning animated features, many of which premiered at the 2010 Tribeca Film Festival prior to theatrical runs in New York and Los Angeles. The films from the Tribeca Film slate were also available on video on demand in 40 million U.S. homes simultaneously with their Festival screenings through relationships with leading telecom, cable and satellite providers. o	Episode 1: Which Religion is Funniest? o	Episode 4: Who is More Jewish? o	Episode 6: Have You Met My Mother? New Video is a leading independent privately-held distributor bringing you quality entertainment via DVD, Blu-ray, download and streaming platforms and cable VOD. We are the proud home to some of the most prestigious names in the industry like A&E®, HISTORY™, Lifetime®, Major League Baseball®, Scholastic Storybook Treasures™, Arthouse Films and Tribeca Film as well as our own lines Docurama Films®, and the newly launched Flatiron Film Company®. Since 1991, our mission has been to unearth first-rate content and deliver them to audiences through traditional platforms and evolving new media. We selectively handpick our library while collaborating directly with our brand partners and filmmakers to cultivate a superior product and fresh new viewing experiences for our audiences. We are headquartered in New York City, but have an international presence in 45 territories.